Quickly change artistic text strings in batch. Works well on text shapes that have an effect applied as well. Also includes a numbering function. Works in text on multiple pages, all at once. This version is for v.2017 only. 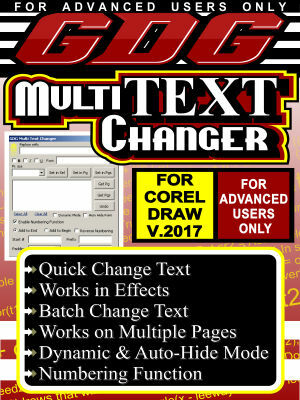 NOTE: This macro is complex and recommended ONLY for advanced CorelDraw users. See video and allow time for learning and then benefit from its powerful features.